Buon giorno. I am really at a loss as to why people consider Richard "Daffy" Dawkins a great thinker. In another post, I gave evidence that he is either uninformed (unlikely) or dishonest (likely) about the idea that atheists wouldn't destroy religious buildings . 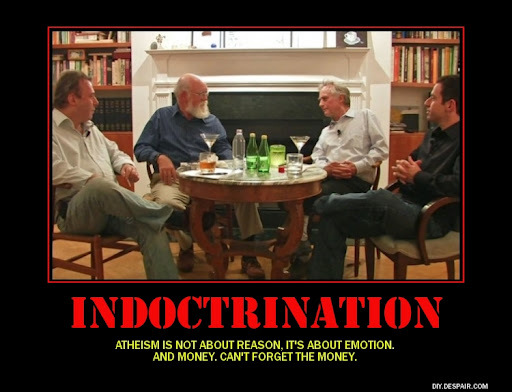 People copy and paste quotes from Dawkins and the other so-called "New Atheists" (much easier than using brain cells) as if they were brilliant bits of philosophy. No, they are simply insulting diatribes, feeding on the existing biases of misotheistic sheep. They hear some insult, say, "Yeah! Yeah! ", then repeat such nonsense. Will Discrimination Against Christians Increase in the USA? Although some people deny the facts, the truth is, there is discrimination and persecution of Christians around the world. In some places, especially those run by atheist and Mohammedan regimes, it is severe. But even in the west, where civilization was built on Judeo-Christian principles, persecution is increasing. Will the European level of discrimination happen here? It very well could. We see it happening with anti-Christian organizations, the loud, detested minority, getting weasel activist judges to go against the wishes of the majority. Political correctness and "tolerance" are attempts at stifling free speech, after all. Read the rest of "Is Europe’s Blatant Discrimination Against Christians Coming to America? ", here. "I do not believe there is an atheist in the world who would would bulldoze Mecca - or Chartres, York Minster or Notre Dame, the Shwedagon, the temples of Kyoto or, of course, the Buddhas of Bamiyan." Buona sera. Atheists tell us that they want everyone to live together in peace, love and grooviness under the benevolent banner of "reason". Of course, it would be a dictatorship under their control, but nobody has anything to fear from intellectually superior and morally pure people, right? Wrong. If you believe that atheists are intellectually superior and morally pure after all I have shown you here, there's something seriously wrong with your thinking bone, capice? I put it to you that the above quote from Richard "Daffy" Dawkins is not a mistake, that he is not uninformed, but that he is lying. The easiest place to find examples of what atheists are like when they gain power is the former Soviet Union. Buon giorno. You would think that I would stop being amazed at the illogical, childish, vituperative attacks that militant atheists have against Christians. (To me, this indicates that they have the inner knowledge that we are right, Romans 1.19-22 ESV, and that burns.) They get exceptionally angry when their words and actions speak for themselves, showing the world the lack of character of many atheopaths. Not only do they detest having the truth told, but have conniption fits when the truth about them is demonstrated in their own words, capice? And sometimes, they delete posts, comments, articles and so forth. Embarrassed, Elliot? The following article is about the militant American atheists. I think the obstreperous nature and basic wickedness of such misotheists transcends geographic boundaries; there are jerks in every country. (Personally, I suspect that those outside of the American borders are more obnoxious.) Unfortunately, the author of the article shows some ignorance of current science trends (especially the claim that "the Big Bang has been confirmed", which not only creationists dispute, but other evolutionists are in disagreement as well). The article the author cites from an atheist site was deleted, but he saved a copy on his own site. If you bother to read the atheist article, note not only the pure hatred, but the utter lack of logic. Astonishing. 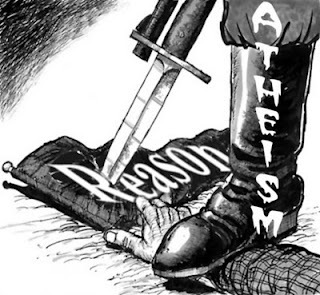 I do want to make a distinction between ordinary individual atheists and militant atheists. This post is about militant atheists, the kind that organizes into groups and then exerts political power to try to trample the rights of religious people. This post is about that kind of atheist, not the ordinary kind that is honest and open to being convinced that God exists. If you are an atheist, and you don’t have any thoughts about silencing religious people, or making religious people deny their convictions, or taking away their rights to speak freely or assemble, then this post isn’t about you. But there is another group of atheists that does have these and other goals, and this post is an answer to them. You can read the rest of "American Atheists: are they much different from Stalin and Mao Tse Tung? ", here. Ciao!